GPSC OMR Sheet: Class 1-2 Preliminary Exam Question Papers PDF – As a part of good news, OMR Sheet has been updated by and for “GUJARAT PUBLIC SERVICE COMMISSION Gandhinagar View your OMR answer sheet for the post of GAS, Class-I & Gujarat Civil Service Class- I & II, Gujarat Municipal Chief Officer Service, Class-II Preliminary Test held on Date: 21/10/2018 Advertisement No. 40/2018-19.” Direct link or URL for the same is better recognized as http://onlineresultdisplay.com/GPSCADVT40/. But only a few authorised candidates can check their OMR Sheets as the candidates will have to enter their Roll Number (enter your written test hall ticket number), enter a birth date (day, month and year) and enter the image text underneath. www.gpsc.gujarat.gov.in is the official website for Gujarat Public Service Commission examinations. 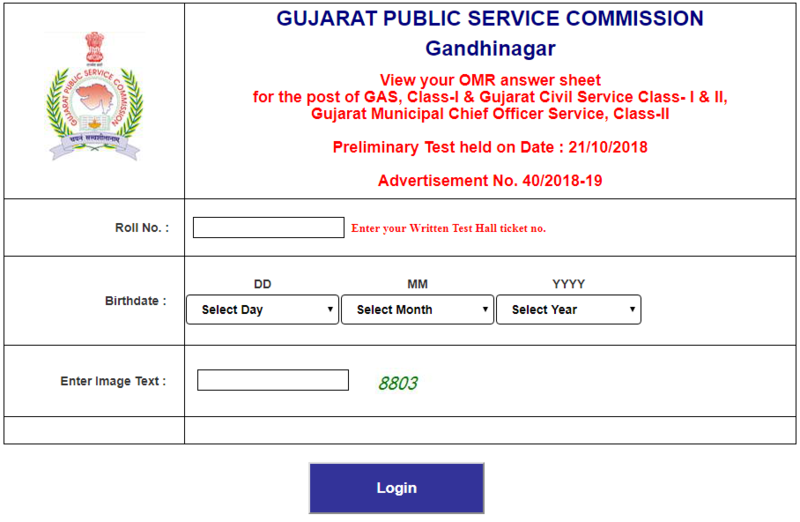 And, on this authentic web portal, apart from just checking the OMR Sheets, candidates can also learn about the Gujarat public service commission calendar, advertisements, exams, interview, result, downloads, utilities, gallery, chairman’s desk. And, they can view the advertisement/ exam calendar, advertisement dashboard, examinations, interview/ final result, PT and mains result, photo gallery and video gallery etc.